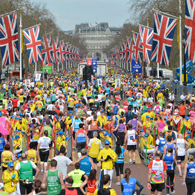 Run through the capital's most iconic landmarks with beautiful scenery and historic buildings. The flat and fast course makes it ideal for beginners and elites. Our charity places are a great way to make a difference to people affected by cancer with every step. We ask that you pledge to raise a minimum of £250 in sponsorship (excluding Gift Aid) and there’s a £25 registration fee. To enter, simply click the ‘Get a place’ button and complete our online entry form. The registration fee is payable to Macmillan Cancer Support Trading Limited which is wholly owned subsidiary of Macmillan Cancer Support. Macmillan Cancer Support Trading Limited donates 100% of its profits to Macmillan Cancer Support each year. Public entry for the 2019 Cardiff Half Marathon is open at the official race website. Once your place is secured click the ‘I have my own place’ button to join the team and order your running kit. There's no minimum sponsorship, just raise as much as you can! What do I get as part of Team Macmillan? Our fundraising pack, access to our online training zone and loads of fundraising tips and tricks. 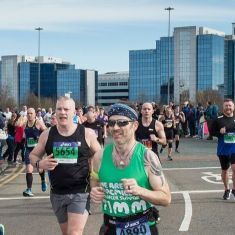 Your free Team Macmillan technical running vest or t-shirt, plus iron on letters to customise your kit. Regular e-newsletters keeping you in the loop in the lead up to race day. And of course... the loudest and most supportive cheerers on the course! Most importantly we will provide you with a reason to put in those months of training and fundraising, because you know that your efforts are going towards supporting people living with cancer in the UK today. Please make sure you read our Terms and Conditions before signing up. You must be 17 years of age or over on the day of the event in order to take part. If you have any questions, email us at running@macmillan.org.uk or call on 0300 1000 200. I have my own placePurchased your own place? Join our team. Get a placeApply for a charity place here. 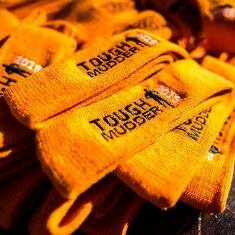 £25 registration fee and £250 minimum sponsorship pledge applies. Which could help run a small Macmillan information and support centre for 1 year, helping people affected by cancer to find information and support. Get your plans rolling. We've got advice, support, materials and fundraisers who'd love to help you create a great event. If you've decided to take on a different challenge for Macmillan, we'd still love you on the Team. Have a look through the latest news, tips, advice and support from our fundraising team. Whether you're cycling, swimming, running of trekking, we've got some top tips for you. We've got the answers to some of the most common questions about fundraising.